The unstable surface when using pilates balls forces the Pilates practitioner to use their core muscles, aid with back health and injury recovery as well as improving posture and muscle rebalance. Using small Pilates balls offer the back support while exercising. This allows the Pilates practitioner to practice a wider range of exercise that would normally be too difficult or painful. 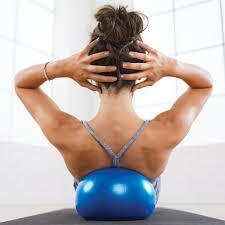 Pilates balls not only supports the back but also helps relieve tension in the back. Simply lying on the ball unblocks the fascia and relaxes tense and short muscle fibers. Pilates balls have been used by physio therapists for years as an essential aid for injury recovery. Pilates balls is ideal to train those hard to reach muscles that fail to get trained in the gym, lifting weights or equally superficial workouts. Pilates balls also add resistance to exercises, many of which encourage pelvic floor activation as well as toning the body. Pilates balls can help you maintain the spines natural curves allowing everyone, not just the super strong, to train while in the correct postural position. This contemporary method of training has been adopted by not only Pilate’s instructors but Physiotherapist and osteopaths alike. Long gone are the days of training with you lower back pinned against the floor to protect the spine! Pilates balls also helps rebalance the body, training anterior and posterior muscles so that the different sides of the body are equally as strong. Muscle imbalance can cause long term injury and pain. For more information regarding the Pilates classes in Barcelona with the Pilates ball contact us here.